Being in nature, living adventures while exploring wild places, along with passionate people from all around the world, with whom lifelong friendships are formed… for me, that is an experience full of meaning. Male Jaguar spotted at Caiman Ecological Refuge. A beautiful fresh Jaguar track found at Caiman Ecological Refuge. Golden-faced Saki Monkey, one of 25 primate species spotted on Apex Expeditions’ Amazonian Brazil trip in 2018. 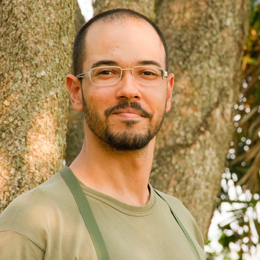 As a young boy, Diogo Lucatelli discovered a passion for the natural world and his curiosity led him to study Biology, Ecology and Natural Resources in his hometown, Salvador da Bahia, Brazil. After graduating, he immersed himself in getting to know and understand the wild wetlands of the Pantanal. In 2012 Diogo joined the team at Caiman Ecological Refuge and by 2013 he was an integral part of the Onçafari Jaguar Project, leaning on his biology background and guiding skills, he also underwent special tracking-skills training. His love for Brazil’s environment, wildlife, people and culture are evident in the way he shares insights and experiences with guests. Tracking, birding and wildlife photography are only a few of the means through which he feeds his passion for nature. Diogo’s quiet passion for conservation combined with a deep knowledge of Brazil’s terrestrial biomes and its creatures helped to immerse us into our rainforest experience in a profound way. Diogo was also lots of fun and often took time to enrich us with stories of his own adventures in the wild. We thoroughly enjoyed traveling with him and can’t wait to join Diogo again in another part of Brazil. Seek out the elusive Jaguar, Giant River Otter, Hyacinth Macaws, Giant Anteater, and more as you traverse Brazil’s spectacular eco-systems. Cruise deep into the heart of the Amazon from Manaus to Santarém at the peak of the annual flood, searching for rare and sought-after primates and birds. Ask Diogo a question about his upcoming expeditions?